Venom is a unique alien movie, consistent with the Marvel we all have come to love. We root for Venom and in return, we are rewarded with a rich relationship between Brock and Venom. In order to bring us the thriller Venom, Columbia Pictures, Sony, and Marvel worked in conjunction and from the previews, Venom looked like the typical alien type scary movie. I was very unsure of how it would set itself apart from all the other alien movies but Venom brings out the alien in everyone and is actually a carefully scripted cohesive screenplay. Many of these alien type movies are all about the alien, but Venom has a very specific beginning, middle, and ending- or so we think. Venom begins with a scientific space expedition crashing into Earth. Far from the general knowledge, this ship contained an alien life force that was sought by Carlton Drake (Riz Ahmed: Jason Bourne), owner of Life Foundation. Drake is trying to figure out how to create a symbiotic relationship with the alien and a human being but when introducing the alien to a human life, the humans always seem to die. Drake sets out to try to find the perfect match. Tom Hardy (Dunkirk) plays Eddie Brock, a down on his luck journalist whose lawyer fiancé has left him because he used her confidential case file in a story, causing him to be fired and blacklisted. Brock is trying to take down Drake in order to revive his career, not knowing all the while what is exactly going down in Life Foundation. With Brock and Drake definite professional enemies, it is very ironic that when Brock becomes infected with the alien, it turns out that Brock is the perfect host. The alien then uses Brock at first to serve his purpose but eventually to serve Brock's fight. The movie has a wonderful cast, including Michelle Williams (The Greatest Showman) who plays Brock's ex-fiancé but really Hardy is the star performer. I was skeptical not knowing if Hardy, who is a great actor but seems to play off his co-stars, could pull off the title character. It was pleasantly surprising to watch him interact with the alien inhabiting him. Hardy's off-key, almost comedic dialogue and actions offset the seriousness of what his character was going through. His frustration over his career and love life was believable and one could understand his friendship with the alien, having something to finally support him after being rejected in both love life and career. Similarly, Venom seemed to have been rejected by his own species and therefore, Venom becomes Brock's friend. Watching the movie, it is clear that Hardy was the perfect choice for this part. The upscale 4K resolution of this feature is a treat as details are generally sharp and clean and the black tones are deep and true, which is especially important in this movie. Of course, once you download the digital version with the Dolby Vision HDR you will only want to watch the movie in that format. Accompanying the excellent video is an exceptional Dolby Atmos audio set. The special effects bounce across the speakers like a hacky sack, surrounding the viewer from all sides. This is the only way one should watch a superhero like a film with plenty of action sequences. 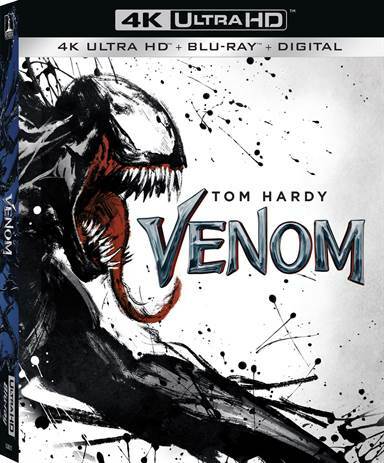 The disc comes with several decent extras including: Venom Mode, From Symbiote to Screen, The Anti-Hero, The Lethal Protection in Action, Venom Vision, Designing Venom, Symbiote Secrets, Select Scenes Pre-Vis, Music Videos, Deleted Scenes, Trailers plus a sneak peek of Spider-Man: Into the Spider-Verse. Venom is a unique alien movie, consistent with the Marvel we all have come to love. Instead of wishing defeat of all the aliens, we root for Venom and in return, we are rewarded with a rich relationship between Brock and Venom. This is a definite must-have for your home collection. Download Venom from the iTunes Store in Digial HD. For more information about Venom visit the FlickDirect Movie Database.